Looking to reduce your accountancy fees? I mean who wouldn’t? But, I bet you didn’t expect to be getting ideas on how to reduce what you pay your accountant, from an accountant? To be successful in business and improve profit margins, keeping the costs of services and goods low will always be important for any business owner. Below we’ve outlined 7 ways you can minimise what you pay your accountant and your overall accountancy costs. 1. Are you using accounting software and other time-saving tools? A lot has been said about accountants ‘lowballing’ fees in order to get new clients. There will always be a percentage of accountants who will use this approach to attract new business. However, an accountant’s role continues develop, business models for firms have progressed, meaning accountancy fees have naturally changed too. Online accounting software plays such a vital role now – it should be on the tip of your accountant’s tongue. No matter how meticulous you are, using spreadsheets or desktop based software to track your finances will always mean something doesn’t quite balance. Your accountant will see figures they’re not expecting and as a result will spend more time checking your financial records. Using online accounting software takes care of these issues and your accountant should be able to get you a discount. 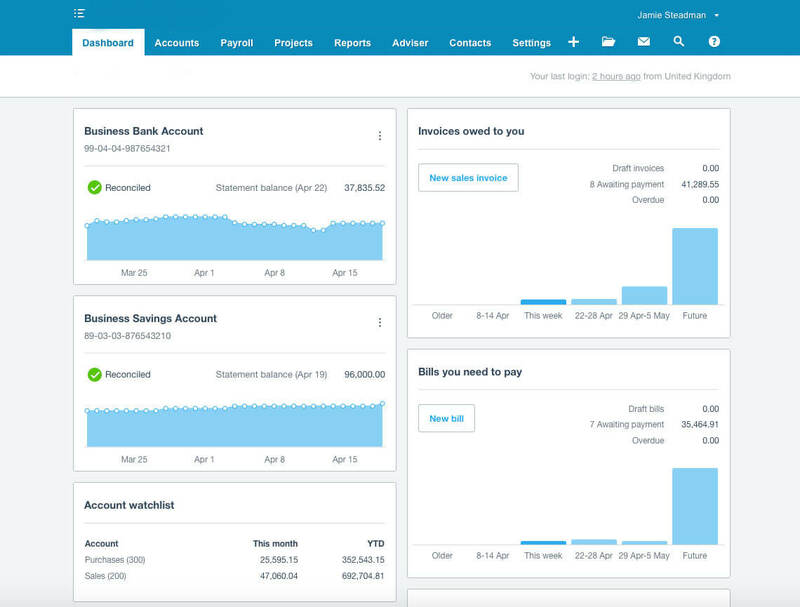 Xero is competitively priced and is pretty intuitive to use. The image below gives you a flavour of their platform. Software does a lot of the heavy lifting that has traditionally had to be done by accountants. This is great for accountants, it saves them time and money. Your accountant should be happy to reduce their fees if you improve your accounting system – it will give them less of a headache after all! This isn’t lowballing accountancy fees, this is just offering a fair price for a quality, digitally led service. Bonus tip: Is your accountant making you aware of other software that can help your business? They don’t have to ‘accountancy’ tools. Software such as Harvest (online time-tracking software) and BrightHR (human resources management) have really come in handy for our clients. Equally, apps such as AutoEntry make data entry from receipts, invoices and statements effortless. Your accountant’s role these days is to let you know, what they know – if it helps you! You hire an accountant for an expert eye and to do the things you don’t have the time for. Do you have time to complete your own self assessment tax return? Are you handing over unfinished bookkeeping that your accountant then needs to tidy up and charge you for? There’s a good chance that your paying excessive accountancy fees for the inconvenience of having to sort out bookkeeping records. Working out what you can do yourself will really help reduce your accountancy fees. Accountants should be doing the work that they need to – or are best placed to do – rather than all the things they “can” do. 3. Are you paying extra for tax advice? A new tax planning practice launched recently in Leicester. Speaking with one the directors of the practice, he said that it was very difficult to be ‘the authority’ on all things to do with tax when there are thousands of pages of legislation and the UK has the longest tax code in the world. Some accountancy firms include a small part of tax planning and consultancy in their service offering. It’s a tactic used to justify high fees, rather than tax advice just necessary part of being an accountant. Unless an accountancy firm has a tax team, you could be paying for “tax planning” that would be better spent with a tax specialist. This is because the advice would be more comprehensive. The days where firms bundle together useless add-ons in an effort to increase their fees are over. Some accountants will bill you for the time spent chasing something as simple as a receipt, if for example this receipt is holding back the preparation of year end accounts. It’s not something we like to do ourselves, but we’re aware of it happening. You could avoid this cost altogether. You might think a missing invoice isn’t important, but it could cause many knock-on effects which are stopping your accountant getting your figures to you. Having a large tax bill land on your lap that you’ve been unable to plan for can be hugely demanding on a business’ cash flow, not to mention stressful. Situations of this kind only come about when the advice from your accountant is reactive, rather than proactive. If it’s reactive advice, it means your accountant is perhaps doing more work than required, and they’ll want to bill you for it. For example, we have a client who is overdrawn on a director’s loan account – they have been removing money from their company in a way which isn’t related to dividends or typical payroll processes. The fact our client is overdrawn isn’t necessarily a problem for the company or a cause for concern, but it can lead to serious tax consequences. Being proactive, this is something we addressed with our client and we’ve put a cash flow plan in place for repayments to be made. By spotting things early, it means there are no nasty surprises from HMRC further down the line. 6. Are you paying for meetings that you don’t need? Unnecessary meetings with your accountant at the end of the year are prolific in our industry. This isn’t to say that all year end meetings are pointless, some are entirely justified and important. However, most year end meetings with your accountant only help justify their fees. Time is money. If there is no insight and your accountant is telling you figures you already know, where’s the value? Email can achieve the same results. If your end of year accounts are left to the last minute, business owners lose the opportunity to get involved in some of the work, e.g rounding up overdue invoices or getting together expenses. Furthermore, getting your year end accounts organised early can present your business with the best tax planning opportunities to help minimise your tax bill. It definitely pays to start early! And you definitely want to avoid penalties for late filing! Make sure your accountant is hot on the latest technology. It will all help towards improving efficiency, saving time. With not wishing to use an overused phrase in business, but time in this sense is money! Work out the tasks you can do and where you need the help of your accountant. Are you being charged for tax advice and planning that would be better spent with a specialist tax team? A proactive accountant will be able to make recommendations that save your business money. Prepare year end accounts at the earliest opportunity.